Two officers were involved in an officer-involved shooting in East Bakersfield this evening near Kentucky and Barlow Street. Officers say that the suspect is currently in critical condition. 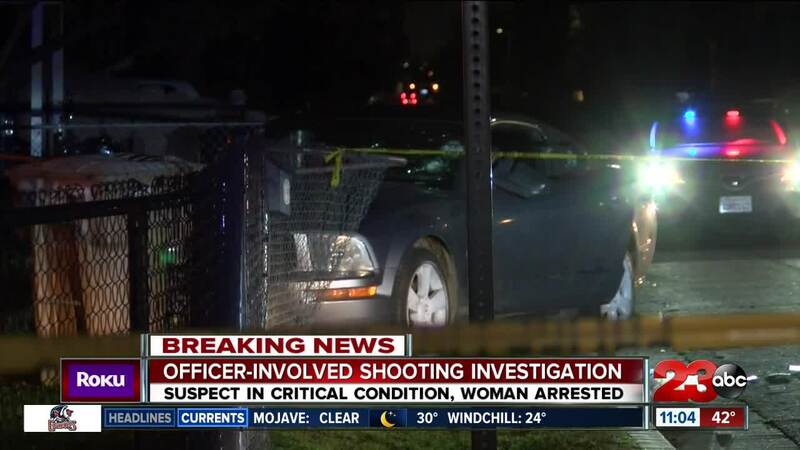 BAKERSFIELD, Calif. — A man was taken to the hospital with major injuries after two Bakersfield Police officers shot him while trying to take him into custody Monday night. Bakersfield Police officials said officers were searching for a suspect in East Bakersfield who had a felony warrant who was also wanted for carjacking and robbery. Officials said police received a tip that the suspect was in the area of Kentucky St. and Barlow St.
Officials said after officers spotted the suspect on Kentucky St. near Barlow St. in a stolen vehicle, they tried to take him into custody and an officer-involved shooting occurred. BPD said two officers fired their gun. The suspect was shot and was taken to a local hospital with major injuries. As of 9:30 p.m. Monday the man was listed in critical condition. Officials did not comment on what led to the officer-involved shooting. A woman was also in the vehicle with the suspect. Officials said she was not injured, but was taken into custody. fficials said that her exact role in the investigation will be released at a later time. Officials did not comment on how the man and woman were connected. The two officers who fired their weapons are on routine administrative leave pending review by the critical incident review board, according to BPD. The area will be shut down for several hours as the investigation continues. Anyone with information on the case is asked to call BPD at (661) 327-7111.